A reader came forward with this picture of a sculpture in his home town of Boston. 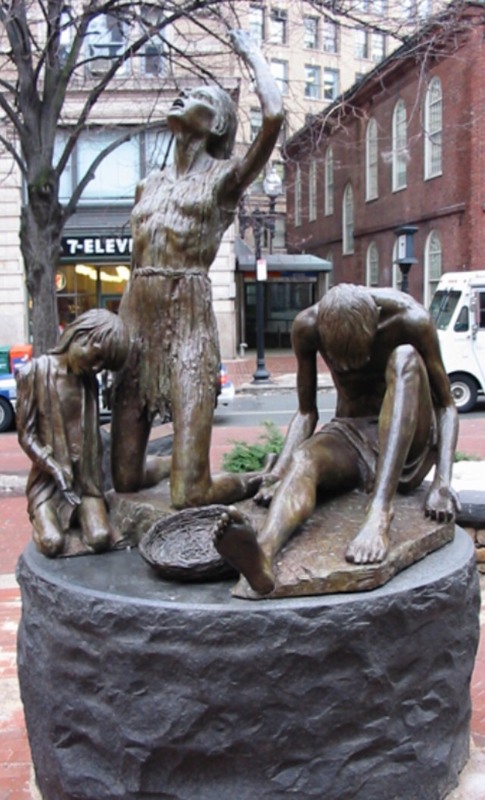 It is one of two groups of sculptures installed in The Boston Irish Famine Memorial, a memorial park located on a plaza along The Freedom Trail. Sculpted by Robert Shure, they were supposed to commemorate the contrast between an Irish family suffering during the Great Famine of 1845–1852 (‘The Potato Blight’) with a prosperous family that emigrated to America. The park was opened in 1998 and received scathing reviews earning it the moniker of “the most mocked and reviled public sculpture in Boston”. The statues are also accompanied by eight narrative plaques. The criticism lies mainly in the fact that the figures are portrayed in an outdated and cloyingly stereotypical manner. Our contributor found this statue particularly interesting because of the little girl’s mourning pose and her ripped clothing which reinforces mainstream stereotypes. This entry was posted in Sculpture, Shure, Robert and tagged Poverty by Ron. Bookmark the permalink. But aren’t those people being portrayed in a manner that communicates sympathy rather than ridicule? Certainly is was intended that viewers should have sympathy for the subjects, but the point made here is that the style of portrayal is out-of-date and modern viewers would see it as sappy and devoid of any imagination. If these statues had actually been commissioned a hundred years ago, then we might excuse this depiction, but why are we taking up park space for more of the same? It is not so much the people—whoever they are—we are ridiculing but the execution of the work.